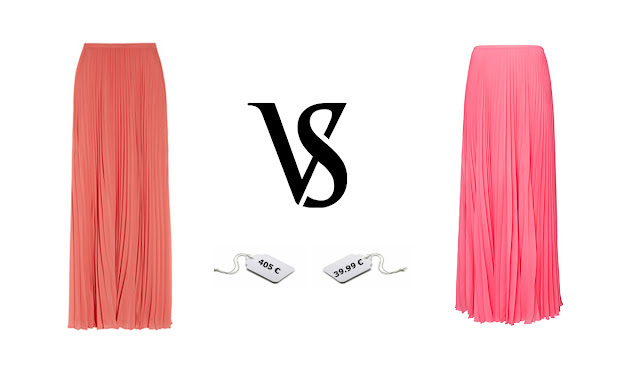 This week, on Ideal vs Great Deal, we have a skirts' challenge! The first one (on your left) is from Halston Heritage, you can check it out here and it costs 405 €! The budget-friendly version is on the right side, it comes from Mango, costs 39.99 € and it can be found at stores and online here (only a few sizes left)! Enjoy the trend dears!!! Αυτή την εβδομάδα στο Ideal vs Great Deal, φιλοξενούνται μακριές πλισέ φούστες! Η αριστερή είναι από την Αμερικάνικη εταιρία Halston Heritage, κοστίζει 405 € και μπορείτε να δείτε περισσότερες λεπτομέρειες για αυτήν εδώ! Η οικονομικότερη εκδοχή της είναι προιόν του Mango, την αγοράζετε με 39,99 € και τη βρίσκετε και στο ηλεκτρονικό κατάστημα του Mango! Απολαύστε την τάση!!! ma pragmatika einai toso idanikh!sxedon idia k m apisteuth timh.teleio! haha that's an unbelievable price difference! I even like the one on the right better anyway! Its really hard to choose. Both are lovely..
Einai yperoxes kai ayti apo ta Mango einai se pragmatika kali timi! They both look great - such great finds! I just love that mango skirt dear! thanks for sharing, this is a beautiful idea! Kisses and have a lovely day! I love them both! The Mango one is a great bargain! Love the copy!!! What a brilliant copy! I really love the color on the Mango one, but the vintage one is Halston and probably really well made and I am a sucker for vintage! hehehee!!!!! What a wicked comparison! you have left me stumped! hahah!!!! Love your bloggy! Τι ομορφο χρωμα που εχουν.amazing. se efxaristo paaara poli gia to sxolio s glikoula...oso gia ti fusta m aresei poli kai tha peraso mia volta apo mango!! What a great deal ! The colour of the left one is gorgeous thought! We like your blog , take a look at our blog called Pretty Tiny Things and we can follow each other if you don't mind !